We welcome Gia Edge, ARNP, FNP-BC to our provider staff. 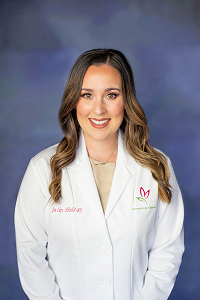 She comes to us with experience in dermatology, she has been recognized by patients and colleagues for her excellence in patient care and dermatological knowledge. Her expertise spans general dermatology, as well as procedural and cosmetic dermatology for all ages. She received her Bachelor of Science in Nursing from Florida Gulf Coast University followed by Master of Science in Nursing-Family Health Nurse Practitioner. She is also a member of the National Academy of Dermatology Nurse Practitioners, Southern Gulf Coast Nurse Practitioner Council, Florida Nurses Association, American Association of Nurse Practitioners, American Nurses Association.